The world is increasing crowded with mid-tempoed electronica bands that use the lush, rich sound of analog keyboards. I still think of this genre as being derived from Boards of Canada, but there are numerous artists that do this style rather well, including Casino vs. Japan, Miles Tilmann, FourTet, and, now, n.ln. n.ln is the project of Niles Lannon, who was one of the guitarists in drone rock masters The Azusa Plane, and has also been in a bunch of other projects i haven't heard of (Film School, Reizoko, and Splendorbin). 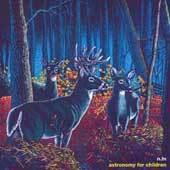 This is an interesting history, and one can see a logical progression from the spaced out drones of The Azusa Plane to the Orb and Boards of Canada-damaged ambient groove of Astronomy for Children. This music is the psychedelic rock of the post-Kraftwerk world. It is to rave kids what Pink Floyd was to rockers. And, i must admit, n.ln does a fine job with it. If you have enjoyed the artists listed above, then this is a great purchase. Although the bulk of the music lies along the same general vibe and feel as those artists, the differences are what make it stand out. Specifically, i like Lannon's drum loop work and his use of vocal samples. Of course, both are used by numerous acts, but n.ln's take on things is a little special, and that makes all the difference. The vocal samples are not just computer mangled noises that fade in and out. Instead, he often uses actually lengthy vocal samples buried in the mix. That's so old school. Remember back when The Orb would do that in the mid 90's? They would play their electronica over an extended vocal track that you often couldn't hear completely, but you were aware that it was there. I always thought that was a good effect, but it has lost popularity of late. However, n.ln uses such a technique on tunes such as Left Bubbles and 4 Little Fires. The vocal sample seems really Orb-like on That Spun My Head, which ends with a low, burbling male vocal loop that really reminds me of the russian samples on U.F.Orb. As to drum loops, well, the trend in rhythm these days tends towards staticky, heavily computer manipulated beats. Often, you can't even tell what the original drum hit might have sounded like, and often there isn't the sort of continuity to the rhythm that an actual drum kit provides. Well, n.ln uses actual drum loops! It sounds like he actually played a record, recorded a bit of drumming, and then layered it under his songs. (How old school, i love it!) The drum loops really work for me, adding a bit of crunchy rhythm in just the right places. In particular the loops on That Spun My Head and Spoke Words catch my attention. Spoke Words is actually such a great song that it deserves it's own paragraph! It over 7 minutes long, and features lush keys, a great catchy drum loop, and weird R2D2 type noises creating a sort of melody/vocal bit. It's catchy and fun, and i really like it. It is definitely the standout on this album. Overall, i am impressed with Astronomy For Children. Lannon has created a worthwhile album that is modern in tone, but references enough of the electronica past to show that he knows his stuff. As far as laptoptronica goes, this is pretty nice. If you are a fan of the genre, then this is a fine album to purchase. Spoke Words, which i feel is the standout on this disc, is available for download at Epitonic. You can judge for yourself.